The Thraikian Peltast was the originator and the best of the Peltastai and these men will often give a better service than their Hellenic counterparts. They are armored in good quality linen and carry a smaller version of the thureos style shield. They are Hellenized warriors, but still have their trademark wild beards, which serve to remind their enemies of their country of origin. They are expert javelinmen, able to pepper their targets with javelins before charging in with their fearsome rhomphaias. They are well trained and among the fiercest and most feared warriors in the entire world, and they know it. This often makes them very impetuous, but an able general should be able to keep them at bay until the right moment. Thraikioi Peltastai can be used with equal precision as skirmishers or medium shock infantry. They are even deadly against armored horsemen, due to their wicked armor-piercing blades. 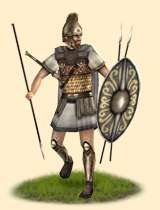 Historically, the Thraikioi Peltastai have been around since the late Bronze Age and are often considered the archetype of the Thraikian warrior, though these Hellenized Peltastai are considerably more heavily armored than their fifth century ancestors. The Thraikioi Peltastai have been plying their deadly trade against Hellenes for as long as any Thraikian or Hellene can remember, and their method of warfare was so effective it was copied by the Hellenes and Makedonians and even mimicked by tribes as distant as the Illyrians. The number of battles and by whom they were used is uncountable. Suffice to say Thraikian peltastai have been used in every major conflict between Hellenic states, and will continue to be used.